Posted on October 5, 2011 May 25, 2016 Categories Events, Restaurant, WineTags Birthday, CFS, Cowboys, Elite, Ruby's CafeLeave a comment on Happy Birthday to Me! Did you know Wines.com is housed here in Austin? 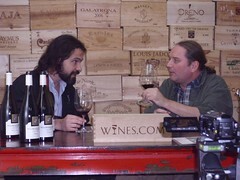 That’s Buckley Wineholt on the right interviewing a winemaker about his pinot noir on wines.com TV. Got an email from Buckley today announcing a big clearance sale TODAY May 14 from Noon-7 at 5005 Commercial Park Dr Austin, TX 78724. I have gotten some great bargains from the VIP list including a beautifully deep shiraz from Two Hands that was #14 on Wine Spectator’s top 100 last year. This wine normally retails for around $60-$80 and I got it at a STEAL for $30 during one of Buckley’s sales. I will be there this afternoon. Hope to see you there! !